Hello to all of my beautiful followers. I have been slammed with midterms and my 2 full times jobs so i apologize for not posting in quite sometime. I ran out of my favorite curling pudding and my local beauty supply store can’t seem to get there hands on it either. I guess it’s just that good. I have been using my natural oils(coconut, olive and castor) when twisting my hair at night and i have been looking like a frizzy mess theses past couple of weeks. 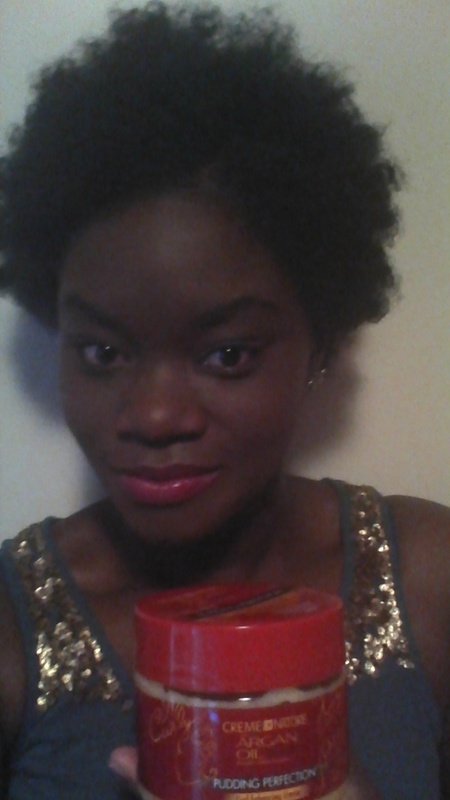 I didn’t know where to turn so i decided to try the creme of nature curl enhancing creme with Argan oil. My first impression was that it smelled great. Not the fruity scent that i am used to, but more so a rich perfume. I co washed my hair with my Tresseme conditioner that i absolutely love and stand by. Afterwards i towel dried my tresses and applied the creme to my hair then used my pick to assure that i was tangle free. I twisted my hair into several Bantu knots while wet and let it dry overnight. In the morning i untwisted and seperated each section and styled my hair with a side part. I was not as pleased as i usually am with my usual pudding. My hair was a bit frizzy and wasn’t as silky as it usually comes out when i twist my hair. Much better than twisting with nothing but pure oils so it did tame my hair somewhat. My takeaway: I would purchase this product again if my usual curling pudding was out of stock. This worked in terms of defining my curls but would not be my number one choice due to the lack of luster and the frizzyness. Remember that everyone is different and you may swear by this product but it’s just not the product for me.